WorkBoat: An articulated tug-barge carrying 60,000 bbl. 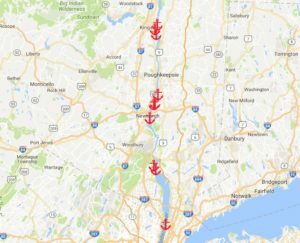 of gasoline up the Hudson River got safely off Tuesday night after running aground about 30 miles south of Albany, N.Y. There was no spill from the double hull barge RTC 150, and a rising tide lifted the 458’x72’ barge and its tug, the 119’x40’x22’, 7,200-hp Meredith C. Reinauer. The ATB continued to Albany where it unloaded its cargo. But the incident is certain to play into debate over a proposal for up to 10 designated barge anchorages along the river, under consideration by the Coast Guard and opposed by environmental groups and town governments along the river. “The Hudson River is a critical piece of the Empire State, both environmentally and economically, and we are launching a full-scale response to ensure this incident does not threaten it,” said Gov. Andrew Cuomo, who visited the scene just south of the Rip Van Winkle Bridge at the village of Catskill. “The full resources of several state agencies including the Departments of Environmental Conservation and Health have been deployed to not only ensure a quick and thorough response, but to launch a full investigation into what caused the barge to run aground in the first place.” Read more.